Sometimes less is more. In this day and age of controllerism, the first thought might be to complicate things, but Livid Instruments took the opposite approach to one of their recent releases, seeing the need for something simple and effective. Remember the Evolution UC33e? One of the most popular controllers of the earlier midi generation featured a simple layout of knobs, buttons, and faders, meant to give the user the freedom to map any one of the controls to any software control function. That's exactly what the Alias 8 provides. With 15 banks (channels) easily accessible through a push button encoder with visual feedback, the number of controls at your fingertips are more than enough to make the Alias 8 your standalone controller, or the perfect addition to any DJ setup. The same encoder when pushed down will turn into cc mode, adding a 16th bank assignable to any software control. The controller comes with a remote script for Ableton Live but it's meant to be personalized however you see fit, whether that means making it a permanent fixture in your studio or taking it out to gigs as your DJ controller. Compared to the Native Instruments Kontrol F1, this particular device wasn't built for plug-and-play with Traktor or Ableton. For any serious controllerist, this won't be an issue, as we take pride in customizing the layout of any controller, even when it does come stocked with presets. 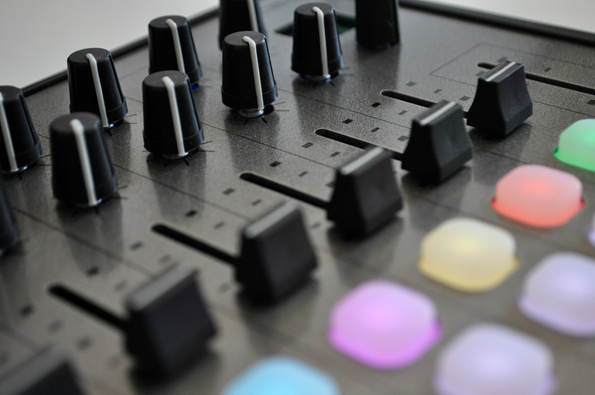 The Alias 8 gives you complete freedom to map anything to any one of its 42 controls, and since that likely will leave you a few buttons short of the complete laptop-using-free DJ rig, you'll want to make use of the push button encoder that gives you access to 15 channels, essentially providing 630 midi notes to work with. The good: One important change to note from the last controller we saw from Livid, the CNTRL:R, is the use of plastic in the fader "arms." At first, I was surprised to see them change from an aluminum part to plastic, but actually this gives the faders enough elasticity to bend without breaking, and if it were aluminum, it would simply bend the metal and stay that way. This way, even when something does push the faders one way (i.e. when you throw it carelessly in your gig bag after a set), they will return to the original form rather than stay bent. The bad: Could benefit from endless encoders with LED feedback rather than rotary potentiometers, as when you switch between the channels, the indicating position on the knobs stays the same, where as if it were LED feedback, the position of the indicators for the knobs would be able to change instantly as the banks or channels are switched. However, this is mostly personal preference, as I'm sure many DJs would rather have standard pots. The verdict: Designed for use both in the studio and in the DJ booth, the Alias 8 provides exactly what you want, fifteen times over. The easily accessible banks or channels sets this apart from most controllers that aim at providing separate channels. The push button detented encoder (meaning the encoder will settle in between rotation steps at a specified interval) makes it incredibly easy to switch between banks, and the actual controls (buttons, faders, pots) are well-spaced and layed out.